Arrow 997 over Powell River Airport. 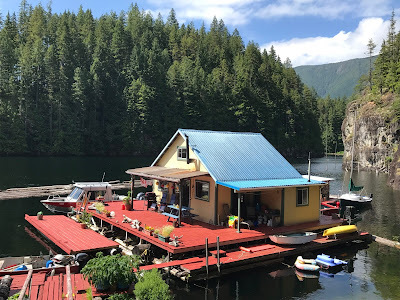 If you've been following my blog, you know that our home is a float cabin on Powell Lake in Coastal British Columbia. We discovered Powell Lake and float cabins during our 2001 summer flying and camping vacation in our Piper Arrow 997. First night at the float cabin. 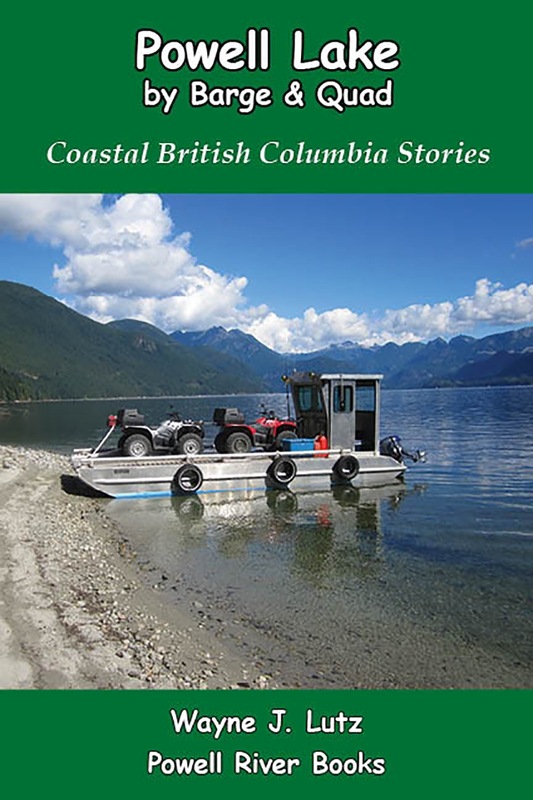 Powell River had an immediate attraction for us including the opportunity for a wide variety of outdoor adventures, beautiful forest and seaside locales, a small town atmosphere, and expansive Powell Lake with its unique float cabins. We rented a 14' aluminum boat (a tin boat to us) and explored Powell Lake. After discovering float cabins we contacted a local realtor, Harry Zroback. A long time cabin owner himself, he gave us directions to the two cabins currently available. First day inside the cabin's great room. The first was old and cluttered. Float cabins traditionally come with everything included. The second was newer, built in 1998. It came with just the basics. That was perfect for us because the cabin would be a vacation home until we could retire from our jobs in Los Angeles. In the summer of 2005 (we were both educators), the float cabin became our primary residence. A small condo in town provided a place for mail, washing clothes, an occasional shower and a place to stay overnight when we have late evening town activities. Our float cabin home in 2017. Solar power and battery banks. Anchor cable repairs and shock absorbers. Chimney cap to prevent smoke blowback. 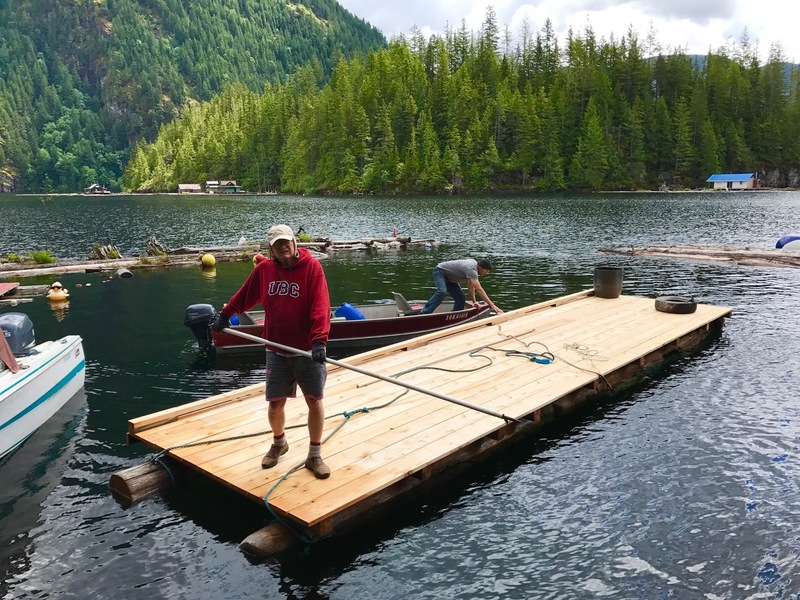 Additional docks for boats and outdoor living. A floating garden with raised beds. A repurposed boat to become a writer's retreat. A rain barrel system for cliff-side gardening. A bathroom addition with a compost toilet. Enhanced insulation and pine paneling. Plastic barrels for extra flotation. Extra anchors and logs for our protective booms. You can read more about float cabin living by selecting Float Cabin Living and Float Cabin Construction in the topic list on the right side of this page. Float garden hoop tunnel to provide protection. In June I attended a meeting of the Powell River Garden Club. The guest speakers came from our local Mother Nature gardening center and focused on fall and winter gardens. In order to get ready to harvest crops during colder months, planting needs to occur during mid-summer. "Frost Blanket" cloth from Canadian Tire. Even though Powell Lake is in plant hardness Zone 9a, we get hot, dry summers. 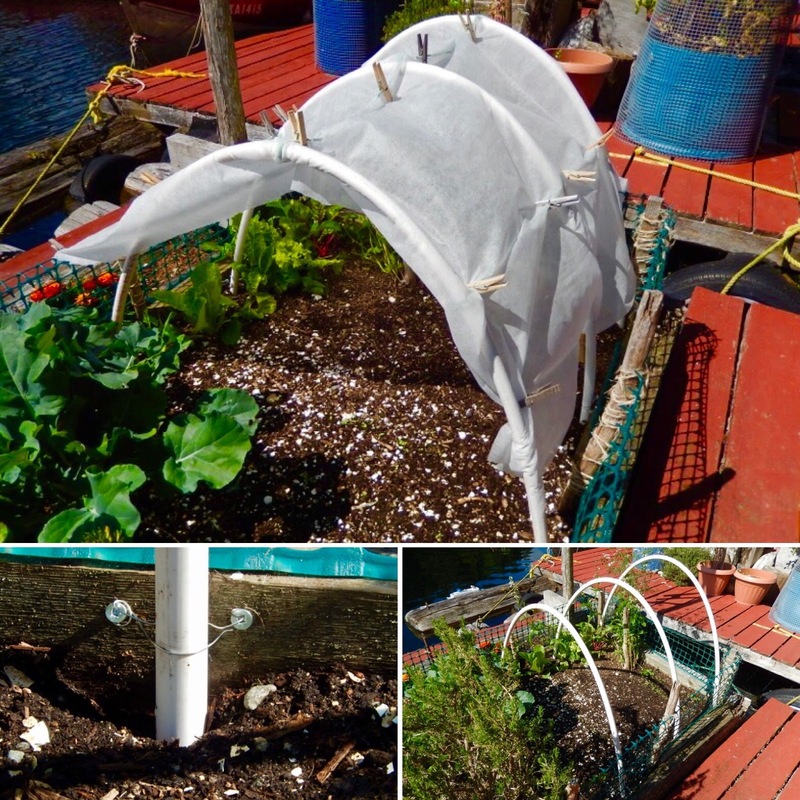 For delicate crops, I decided to create a simple garden hoop tunnel. During summer it provides extra shade for sprouting seeds. When winter comes, it provides relief from freezing temperatures. Screws and wire to secure the pipes. The Rona yard worker cut the 20' PVC pipe into three equal sections to make it easier to transport and ready to use. Two cuts cost $2. I built my garden hoop tunnel at one end of the raised bed in my float garden. I pushed the two ends of each pipe section into the soil to the bottom of the bed. The side boards held the bent PVC, but ensure they remained in place Wayne screwed and wired them in place. If you don't have a raised bed you can drill deep holes to seat the poles. The three hoops in place over a cleared bed. I used plastic coated plant tie wire I had on hand to connect the hoops together. I cut the Frost Blanket to fit and draped it over the hoops. I used clothes pins to attach it to the wire on top and along the sides. I also pinned it to the plastic fencing around the sides of the beds. Right now the top cover provides shade during the heat of the day. 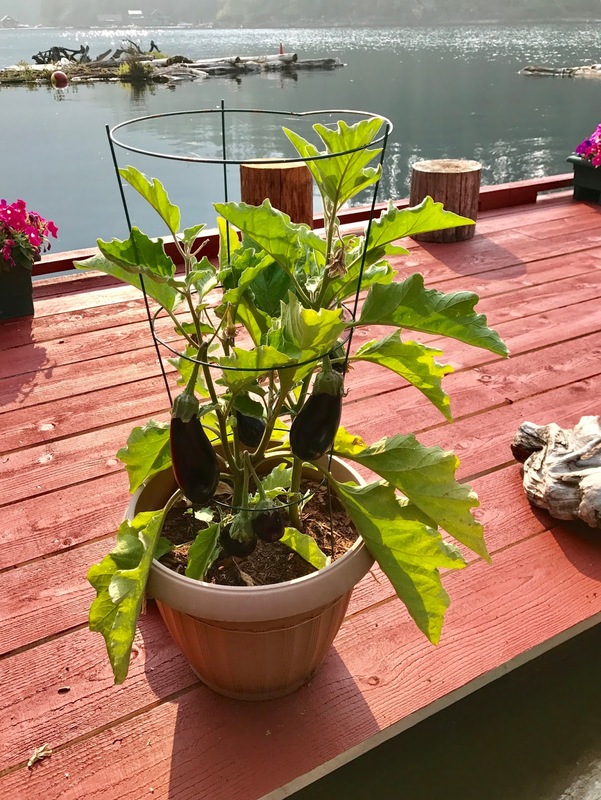 Amethyst eggplant is container sized. Wayne and I want to be healthier and lose weight. We read Eat to Live by Joel Fuhrman and have put many of his recommendations into action. Growing some of our own food has helped for sure. A big eye opener was protein. You always think of animal proteins, but many vegetables are high in protein without the fat and calories. Slice, salt and drain zucchini and eggplant. Saute onion, garlic, and mushrooms in one teaspoon olive oil. Add herbs and heat to release flavours. Add bell pepper and tomato and cook until soft. Finally add pasta sauce and let simmer for 30 minutes. I had home canned tomato sauce so I used that instead. Oil and broil to light brown. Slice eggplant and zucchini lengthwise 1/4 inch thick. Arrange a layer over sauce in the dish. Lightly salt and drain on paper towels for 30 minutes. Spray a baking sheet with cooking spray. Lightly oil eggplant and zucchini slices and broil each side until lightly browned. Mix ricotta, Parmesan cheese, drained chopped spinach, Italian herbs, and garlic powder. I used dried grated Parmesan cheese because I keep it on hand at the cabin. The rest of the cheeses were fresh from the store. Coat a 9.5 x 9.5 inch deep baking dish with cooking spray. Ladle sauce to cover the bottom. Cover with half of the eggplant and zucchini. Top with sliced red pepper and torn basil leaves. Add cheese filling and sprinkle with mozzarella cheese. Lightly cover with sauce. Cover first layer with cheeses and more sauce. Layer with eggplant and zucchini, then remaining sauce. Bake covered at 350 degrees for 45 minutes. Remove cover, add cheese, and bake until lightly browned. Remove from oven and let rest before serving. Finished Eggplant and Zucchini Parmesan. Yum!! This casserole provides a substantial main dish for 8 hungry diners, or plenty extra for frozen meals. Try adding a salad with sliced tomatoes and fresh basil to complete the meal. Definitely healthy and filling. Fresh eggplant and basil from the garden. An added benefit for us was having homegrown ingredients including: home canned tomato sauce, dried onions, frozen spinach, peppers, basil, eggplant and a bit of zucchini. A little over a year ago I saved directions about how to make a twirling bottle bird feeder from one of my favourite blogs, Wanderin' Weeta (With Waterfowl and Weeds). The twirling design was to make it squirrel proof. My problem isn't squirrels, but a Steller's Jay that is making a mess with my bird feeders. He's too big and knocks the seeds into the lake. Choose a clean plastic pop bottle. Push a small nail through the plastic about an inch and a half up from the bottom. Use a large nail then a straight pen to make the hole fit the stick. Make another hole on the opposite side of the bottle. Use a nail and hammer to make a hole in the center of the lid. Use a sharp knife to cut two inch horizontal slits about 1/2 inch above each hole. I used duct tape to cover the sharp lower slit edges. Squeeze just above the slits to make U-shaped openings for birds to reach the seeds. Thread twine through the slits. Tie one end firmly around the top of the bottle just below the lid. Pull on the other end until the twine holds the two U-shaped sections permanently open. Tie firmly around the neck of the bottle. Force the twig (I used a length of bamboo plant stake) through the bottle. It should fit snugly. This will make the perches. Thread another length of twine, about 3 feet long, through the lid. Tie the inside end around the washer or nut. Pull the washer tight inside the lid and tie a knot on the outside. 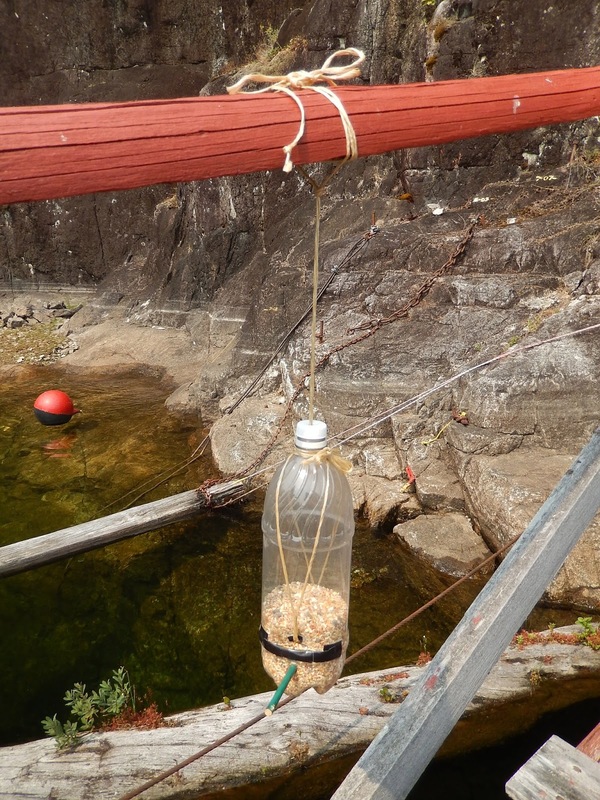 Fill your bottle with bird seed. Hang the bird feeder from a tree or post. To keep squirrels off, hang it at least a foot away from any branch. I hung my new twirling bird feeder on the bridge railing. Did it solve my Steller's Jay problem? Well, not completely. But with smaller holes in the feeder, the Oregon Juncos at least have a fighting chance to get something to eat before it all gets flicked out. The first night sleeping in a tent at our off-the-grid cabin. Sometimes life presents opportunities that are too difficult to ignore. 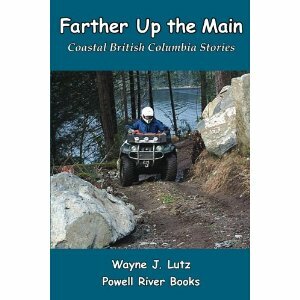 That's the way it was for us when we discovered British Columbia's Sunshine Coast. 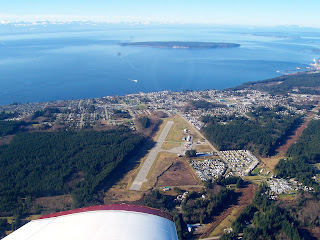 We came here on a flying vacation in 2000 and fell in love with the area. In 2001, finding a unique off-the-grid float cabin on Powell Lake sealed the deal. John during construction of a bathroom addition. We purchased a cabin built by a local named John. 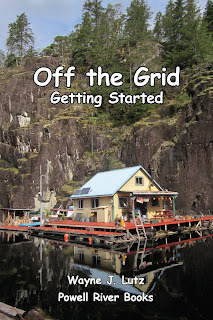 We knew very little about off-the-grid living, but were avid campers. In fact, we camped on the cabin deck until the transfer was final. 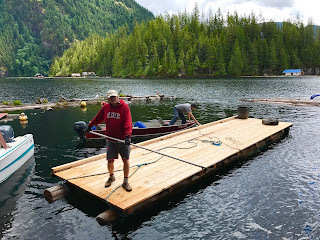 Wayne helps John install a new front dock. We say that when we purchased our cabin, John came with it. Over the years he's been our off-the-grid living mentor and a good friend. By working along with John at our cabin and others around the lake, we've become more self reliant. Without his help, getting started would have been a lot more difficult for two "city-folk". 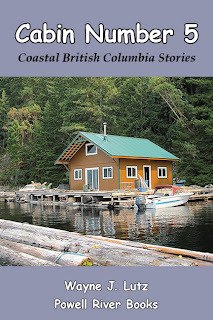 In Wayne's thirteenth book in the Coastal BC Stories series, he shares how we got started in making a home in a remote location away from public utilities and services. Have you ever dreamed of moving off the grid and living in harmony with nature? What will it take? How do you get started? 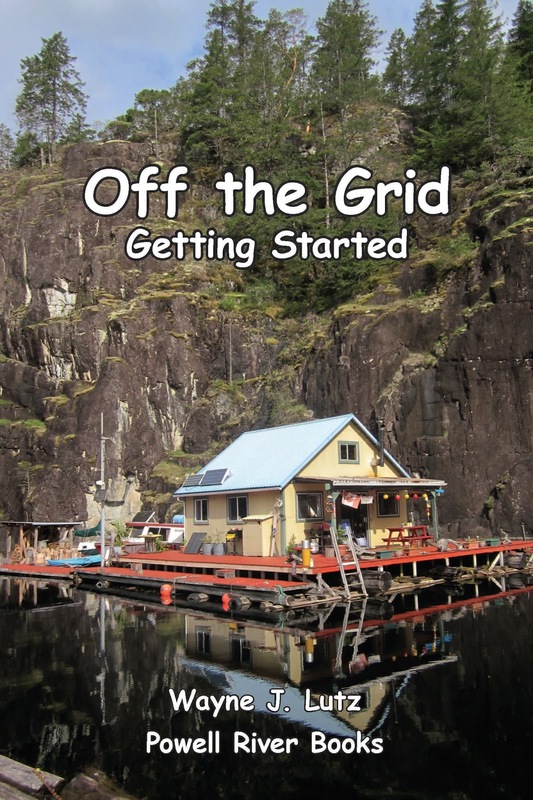 In Off the Grid: Getting Started, Wayne shares valuable insights from our experiences that will inspire and assist you in fulfilling your own dream of a major lifestyle change.